The fifth annual Rockstar Energy UPROAR Festival hits the road this Friday, August 15 in Detroit and runs through September 21. The festival’s powerful lineup includes multiplatinum mainstage bands Godsmack and Seether, along with Skillet, Buckcherry, Pop Evil, Escape The Fate, 3 Years Hollow, Within Reason, New Medicine, 2013 UPROAR Ernie Ball Battle Of The Bands winner Sons of Revelry, These Raven Skies, and Tattered. Headliners Godsmack have just entered the Billboard 200 chart at #3 with their 1000hp album, while the title track is now #1 at Active Rock radio. Main stage band Seether now holds the #3 position at Active Rock with “Words As Weapons” after spending time at #1. The Rockstar Energy UPROAR Festival has partnered with Yamaha Motorcycles to give away a brand new 2014 FZ-09 with an UPROAR themed paint job from world-renowned custom motorcycle painter Taylor Schultz. Enter to win the Yamaha FZ-09 online HERE or stop by the Yamaha booth at any local UPROAR stop for more ways to win. Additionally, fans have the opportunity to win a complete Rockford Fosgate car audio system so they can listen to their favorite rock bands loud and proud. Click HERE to enter to win. Tune into radio stations across the country for backstage meet and greet opportunities with bands and for chances to win other prizes, tickets, and more! Tickets and details for each Rockstar Energy UPROAR Festival show are available HERE. The UPROAR festival area features a variety of activities, information booths and vendors throughout the afternoon and evening. Concertgoers arriving early will also have the chance to meet some of their favorite bands daily at the Rockstar Energy Drink Compound, and COLDCOCK Herbal Whiskey will host other autograph signings. 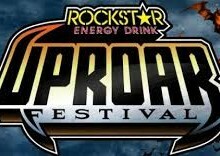 For band performance and signing times, visit www.RockstarUPROAR.com. Rockstar Energy Drink: Rockstar Energy Drink is designed for those who lead active lifestyles – from Athletes to Rockstars. Available in over 20 flavors at convenience and grocery outlets in over 30 countries, Rockstar supports the Rockstar lifestyle across the globe through Action Sports, Motor Sports, and Live Music.